Have enough space to run at a full sprint for a sustained period. Have enough new ground to explore to keep their natural curiousity alive. Be able to forage for food representative of their natural diet. To the extent possible, this should make up the majority of their feed. Supplemental feed when used should be processed as little as possible and be as close to their natural preferences as possible. Not be unnaturally confined or fed a certain diet during certain phases of their growth to achieve an unnatural outcome. All animals feel happiness and sadness, excitement and fear. They are all naturally curious and thrilled and challenged by the "new" and by opportunity. We believe ensuring an animal's mental health is not only an obligation but that it has a positive impact on the quality of the meat and other products. In situations where the habitat does not provide for this naturally, artificial methods should be employed. We believe in limiting the stress on animals in all phases of their lives, especially during transport and slaughter. In our minds, on-farm slaughter of animals by stunning the animal prior to sticking is the best and most humane approach. 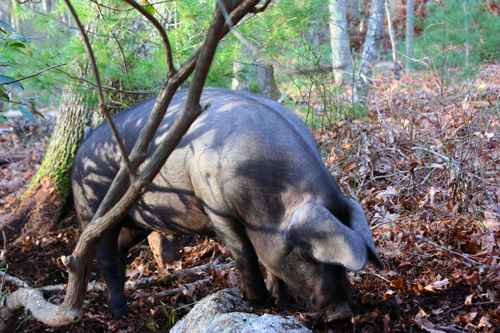 Habitat: We raise our pigs on woodlands where they can root for food (and just for fun) and don’t feel overly confined in their space. This year we raised our five pigs on two acres. They have enough space to run at full speed unencumbered--chasing each other around or running to supper. They have sun-filled spots to lie in, trees to rub up against, and shady spots to hide or stay cool. Slaughter: We get our pigs slaughtered at Adams Farm in Athol, MA. They employ a corral system designed by Temple Grandin and stun the animals before sticking. Unfortunately it is two hours away. We are committed to contributing to the availability on on-farm slaughter options for small-scale farmers and homesteaders in New England. That is by far the most humane approach. Habitat: Our five goats have a full half acre filled with a good mix of scrub brush, small trees, and some grassses. They also have some great big rocks on which to lie, chase each, or to scratch their hooves. Feed: Goats thrive on edge habitat and we plan to regularly rotate them in the coming years to give them continued access to the bushes and plants they love to pick at. It is very hard to find organic goat feed and hay. We feed them a grain mix from Poulin Grain as well as hay from the local feed and grain store. We'd love to find more organic sources of feed. Habitat: Our chickens have an 8x10 McMansion of a coop and a Fort Knox-esque run of approximately 1,000 sq ft--it includes trees, rocks, and bushes. We are improving our ability to keep this run a vibrant interesting environment by adding fallen leaves and green table scraps. We let "the ladies" out into the yard as much as we can and will be exploring new ways of giving them all rotating access to new ground next spring. We have many predators and have erred on the side of keeping them alive to date--we need to strike a better balance. Feed: In addition to letting them free range as much as possible, we feed them Green Mountain organic pellets. As with the pigs, we'd like to mix in more natural and less processed feed in the future, including various legumes and root vegetables like mangel beets, etc.